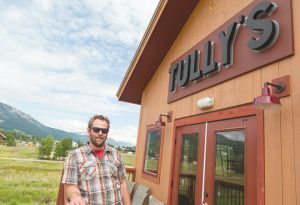 Tully Burton grabs a slice of pizza between phone calls, deliveries and the busyness of ongoing daily operations in his new restaurant and bar in Crested Butte South, named appropriately and deservingly, Tully’s. He’s a big guy with an even bigger smile and a lot more on his plate these days than pizza. But the restaurant is his dream, and he’s not only making it work, he’s living it and loving the challenges and rewards. As the youngest of three brothers, and the self-proclaimed troublemaker, Tully may have gotten an early influence of restaurateur from his father, who managed an eatery where, as a kid, Tully would ace Pac-man while sipping a Shirley Temple. He grew up 17 miles north of Cincinnati in Green Hills, one of the greenbelt communities initiated by President Roosevelt in the 1940s as a self-sufficient town built to create jobs and economy. By the time he graduated from high school in 1999, Tully was enthralled with live music and traveling to concerts. He was also very gifted in a variety of mediums in art and was especially interested in architecture, which he put to use when he designed and drew up the elevations of his new building. Immediately after high school, Tully was working odd jobs, trying to find a direction in life and enrolled in architecture courses at a community college. He later transferred to the University of Cincinnati but his friends were starting to move out of the area and he found himself wrapped up in wanderlust. One of his jobs was working for an entertainment company as a groundskeeper and the general go-to guy. It allowed him to see all the concerts and he could be backstage hobnobbing with the big-name artists. Being introduced to that kind of a scene at a young age triggered a desire to create something bigger, because after experiencing it from the perspective of a ground floor employee, he realized the complexity of production. “It’s not just that a person shows up and is on stage. It’s the coordination of what it takes to get to that point and get it done,” Tully grasped. Tully’s love of music led him into the festival scene, and while he was enjoying the jam bands at the All Good Music Festival in West Virginia with 18,000 other partygoers, his van broke down, which turned into a life-changing event. He couldn’t leave so he signed up as a volunteer to do the massive after-fest clean up. He also noted that the variety of goodies you can find laying on the grounds after concerts like that can be a real bonus. He discovered that the company hired to organize the clean up, Clean Vibes, actually had contracts for several festivals so they had a core crew who not only got paid well, but were also provided with other stipends like hotel rooms, three meals a day, plane tickets, backstage passes and the opportunity to meet the performers. At the time, Clean Vibes was new and inefficient, and it took a month for the 100 people they started out with to clean up the large acreage and farms where the festivals were held. Tully hired on with them and moved up to supervisor within the year. He stayed on for three summers before moving to San Francisco, feeling it was time to return to school. Enrolled into the Community College of San Francisco, Tully was doubling up on art and business courses through scholarships and grants. He had a sweet deal with his art studio on the piers, looking out on the bay to the Golden Gate Bridge. “I was doing more print making, getting into all the techniques, especially really old techniques, which are more interesting than Photoshopping,” he felt. But just as he was ready to begin his fourth year, California changed their funding parameters, and his tuition funding was cut completely. It was going to cost an exorbitant $40,000 just to finish that last year. It was a difficult decision, but he knew he couldn’t afford to spend that kind of money, so he packed up and left for Cincinnati, as a home base to return to work for Clean Vibes. “I wanted to experience the city but cities are crazy and I was ready to get out. I got to know the underbelly and the scenes that tourists would never know, the heartbeat and life of the city,” he said of his time in San Francisco. Back in Cincinnati, Tully was enjoying working for Clean Vibes. It was an easy life. During his first stint working for the company a few years prior, before the West Coast move, his work supervisor was Elise Meier, and they had a lovely fling but Tully admits he wasn’t interested in a long-term relationship since he had already decided to move to California. When he returned to Clean Vibes for the second time in 2006, the two reconnected while working at Bonnaroo. “So, I’m at Bonnaroo in a short bus and rekindling our relationship, traveling to the different festivals doing cleaning up and at the end of that summer, Elise and I talked about what our plans were,” he smiles of “The Talk” couples eventually must engage in, and although he was planning to move to Asheville, Elise had been living in Crested Butte for a couple of years and told him it’s the only place she’d consider living, especially since she had just bought a house there. That was September 2006; he and Lisa have been together for 10 years now, and the really big news: the couple is expecting their first child early in October. Tully’s first job here was managing the Crested Butte South General Store during the winter of 2006. It was busy and booming, he notes. The next summer he and Elise were still contracted to work the summer festival circuit with Clean Vibes, and returning in the fall, he had lined up a job at the Crested Butte Mountain Resort ski rental shop for that winter of 2007. Tully did the seasonal shuffle of being gone in the summer and back in the winter for four years through 2010. Winters now found him working at Red Mountain Liquors and back at the General Store where he was cooking, making the sandwiches and serving the Crested Butte South crowd. When the General Store closed its doors in the spring of 2011, Tully leased the building and went into business for himself that summer. He felt the economy was improving and he could make it work. He was carefully watching the trends and realized that the demands in Crested Butte South were increasing to the point that a grocery-convenience store, gas station, restaurant and bar in one location wasn’t what the down valley population needed. He bought a commercial lot and broke ground on the summer solstice of 2015, opening Tully’s this April 2016. He smiles that as an owner you have to be prepared to be the cook, dishwasher, bartender, server, janitor and accountant. “You do it all when you own it,” he knows from experience.